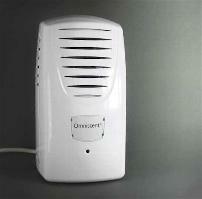 Using air fresh units in your business premises can help create a good impression and a positive view of your company. They contribute significantly to a pleasant environment for both your staff and your visitors and will help eradicate any unpleasant odours. The air fresh units supplied by Eurocare can be wall-mounted and are computer controlled. At programmed times during the day they can be set up so that a concentrated fresh fragrance can be released into the atmosphere and give your business premises a welcome bouquet that refreshes the area. This ensures that anybody using the space is kept comfortable and the environment is a pleasant one to be in. The Air Fresh IPE system is a sophisticated air freshener unit which gives you flexible programming options. This allows the release of fragrance and odour control tailored to the specific location conditions. 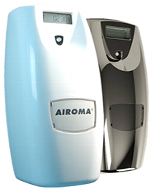 Its sleek and compact design allows the Air Fresh IPE dispenser to be used in a variety of different locations and it contains unique features which include a countdown clock that indicates the time between each spray. You are able to select the number of refills that you want per year and you can select the intensity of the fragrance and program the periods of fragrance release up to 3 times per day depending on the location requirements. If you have predictable busy periods you can set higher fragrance levels if required. The Omniscent® fragrance delivery system is a unique system that can provide continuous and consistent fragrance delivery to large interior spaces. This makes it perfect for hotels, casinos, gyms, reception areas and large conference/function rooms. Just one unit can provide fragrance to an area of up to 500 cubic meters and the frequency and intensity of the releases can all be controlled by the user. Bespoke fragrances can be created depending upon specific requirements. To find out more about our unique range of air freshener units please contact us on 02920 868961 and speak to one of our specialist team.